Five years ago, John Kosmal started the Michigan Pinball Expo to unite local pinball machine collectors, and increase the sport’s popularity among people of all ages. Since then, through social media and word of mouth, the event has grown and evolved. With more than 110 machines from the Brighton Arcade, Marvin’s Marvels and Kosmal himself, the expo offers patrons the chance to enjoy more than 57 hours of game play this weekend, in a fun environment that brings back the love of the game. The expo gives people access to antique games dating back 50-70 years, including the 1947 Humpty Dumpty, in addition to wood-rail games from the 50s and 60s. While there are a lot of vintage machines available for play, there are also newer games to try, like this year’s Ford-sponsored pinball that projects onto a screen above. Doug Schildercrout and Mike Herr are two Ford employees who have been coming to the expo every year after seeing a poster at work advertising the event. Not only did they come to the expo this year to try out the Ford Mustang pinball machine, which just-so-happens to be the newest pinball machine on the market, but they also came for their love and appreciation of the game itself. Another draw to the expo is the competition. Kosmal said the constantly-evolving show brings people from around the world to compete in the daily and main tournaments, which offer cash prizes of $500 and $1,000 for first place at the different levels. Parker Thomas, from Commerce Township, has been a part of the expo every year. He helps fix as well as maintains the machines. Marco Specialties is a company based out of South Carolina that travels with the expo, selling general parts to collectors who may want or need to improve the appearance of their pinball machines. Company representatives have the ability to take orders and send out products directly from the expos, since they tend to draw crowds from all over the world. 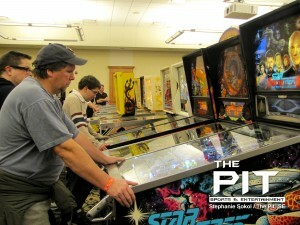 While Texas has drawn one of the expo’s largest crowds, the Michigan show has proven to be smaller in scale, with a more personable environment– providing a great pinball experience. The Expo continues Saturday, April 5 until midnight, and Sunday from 8 a.m. to 5 p.m. at Oakland University’s Oakland Center. Tickets are $20 for 16 and older, $15 for age 4 to 15, I.D. required at the door. For more information about Michigan Pinball Expo, check out their website, follow them on Twitter and Facebook.